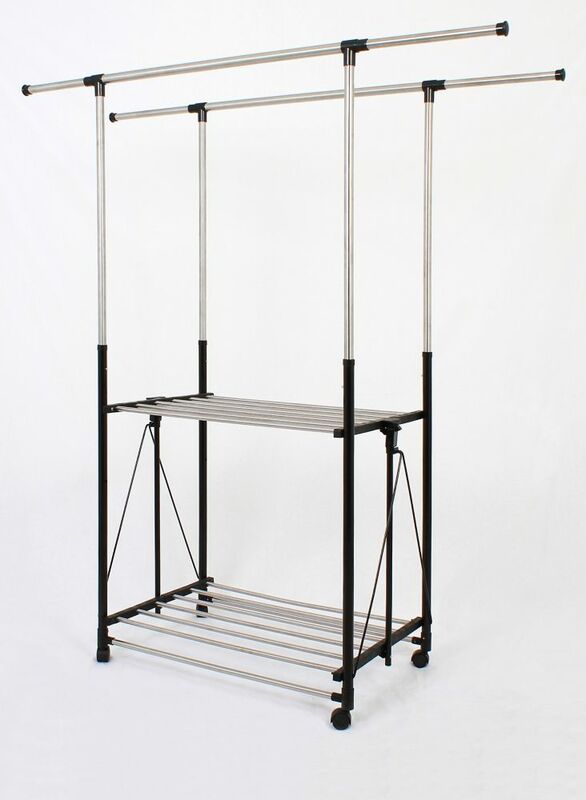 Multipurpose and versatile, this heavy-duty garment rack can be used wherever extra hanging space is needed! Designed with stainless steel bars with adjustable height and expandable width, locking swivel castors and 2 shelves, this rack is the ultimate solution for your extra clothes storage. Collapsible design makes set-up easy and hassle-free, easily folding down compactly when not in use. Honey-Can-Do HNG-01733 24-Pack Wood Suit Hotel Hanger, Maple Finish. Beautiful, wooden clothes hanger has a contemporary design perfect for keeping shirts, dresses, and jackets wrinkle-free. Hotel style circular bar hook stays put when installed on any standard closet bar. These hangers also work great on rolling garment racks, keeping hangers and clothes in place. When needed, hangers easily detach from the circular hook. A gorgeous upgrade for any closet space. Greenway Collapsible Garment Rack Multipurpose and versatile, this heavy-duty garment rack can be used wherever extra hanging space is needed! Designed with stainless steel bars with adjustable height and expandable width, locking swivel castors and 2 shelves, this rack is the ultimate solution for your extra clothes storage. Collapsible design makes set-up easy and hassle-free, easily folding down compactly when not in use. Greenway Collapsible Garment Rack is rated 4.5 out of 5 by 26. Rated 5 out of 5 by HomeDepotCustomer from I really like this garment rack, it holds a lot... I really like this garment rack, it holds a lot and folds up to a very small item. Rated 1 out of 5 by Hipster Doofus from Very lightweight It lasted about 10 days before it folded over and broke like a cheap tent. I need a garment rack that will fit in a 54&quot; space. Can this be adjusted to that width?